"Sorry of my english," reads a handwritten scrawl on the page before the Prologue of Xiaolu Guo's 'A Concise Chinese–English Dictionary for Lovers'. One might think that there is no need for the author to apologize, but that's not the case. The apology itself is yet another carefully placed linguistic grace note, the first pluck of a string before the symphony starts. Guo's first novel in English lives up to its title. It is indeed concise, and that focus keeps it funny and entertaining. The dictionary format makes it a breeze to read. But there's more than a breath of fresh air to be found here. Guo's novel of love and language, of the love of language is not about dictionary definitions; it's about how we define ourselves. A twenty-three year-old girl from a rural Chinese village arrives in London, sent to learn English so that she can return to help her parents scale up their shoe-making business to accommodate international sales. Even as she arrives Zhuang is a cultural contradiction, and upon her arrival, her name disappears almost as fast as her identity. Z, as she's occasionally known — most often she's tellingly nameless — determines that she shall learn the language by writing down the definitions of words at the top of a series of short and often funny diary entries. Even though the language is simple, the character and her observations are clearly quite complex. She meets a nameless man at a movie, who calls himself an artist. On their second meeting, almost a date, she tells him that she'd like to see where he lives. "Be my guest," he responds, a command she takes literally. A week later she is moving into his house. Thus begins a literary romance and education like no other. Guo starts things off quite humorously, using her "broken english" to excellent effect. But that's not the only trick up her sleeve. The simple words belie a sophisticated point-of-view and a subtle sensibility. Guo's humor covers the entire range, from straightforward jokes to complicated perceptual riffing. Combined with the broken English style, it's quite fun to read. 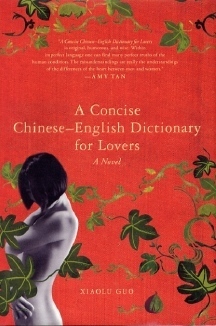 But although it is funny, 'A Concise Chinese–English Dictionary for Lovers' is of course much more. Guo uses the process of acculturation as a compelling plot point. The reader cheers every time our heroine displays in her language yet another unconscious indication that she has been assimilated just a little bit more into the culture that surrounds her. The culture she's leaving behind is equally fascinating. Guo's Z is a true believer in the Communist Chinese ideals; the power of the collective is palpable and real to her. She bumps up against the chaotic capitalism of London with a sense of wonder that makes our familiar surroundings seem suddenly exotic and alien. The heart of this dictionary is a love that begins as a familiar attraction between a man and a woman but soon becomes much more. As Z learns the language she learns to love the new identity she acquires in the process. In contrast, her nameless lover follows a more tragic path, as he seems to age more quickly and lose his own language. The abundant humor remains, but tinged with poignant power and the wistful sensibility of the self-displaced. All of this is viewed through the lens of Guo's carefully controlled broken English, a remarkably accomplished performance that reveals and conceals the shifting fault lines within Z. As the words accumulate, as the feeling coalesce, 'A Concise Chinese–English Dictionary for Lovers' does indeed map from A to Z — of the human heart.